Spring brings more than sunny days to the Northwest; for pet lovers it marks the kick off of the pet event season — which is packed with opportunities to get out and enjoy sports and games, “Olympic” competitions, festivals and more. The biggies this month include the Walk for the Animals May 5, NW Pet Fair May 5 and 6, Doggie Dash May 12 and Mutt Masters on May 19. 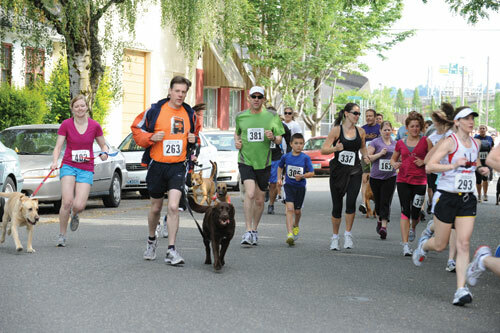 Now’s the time to circle the date for the popular Run for the Love of Dove, a fast and flat timed 5K race in which people compete with their trusty co-pilots by their sides, all to benefit beloved nonprofit DoveLewis Emergency Animal Hospital. KEEN Garage invites folks to stop by its digs 10am-7pm May 16 or 17 to register early and receive a free KEEN gift and a 20% one-time coupon. Don’t know KEEN? Quintessential Northwest and a must-know for anyone who loves to “play anywhere there’s no ceiling.” Get acquainted at KEENfootwear.com. Run for the Love of Dove benefits the DoveLewis Stray Animal & Wildlife Fund, which provides care for any injured or sick stray or wild animal taken to the 24-hour emergency and ICU animal hospital. Last year, 1,504 animals were treated, at a cost of $160,000, thanks to the 100 percent donor-supported fund. More than 500 people, along with 190 canine companions ran last year, raising $27,000 for the program. This year is expected to be bigger and better. Admission is $30/person + co-pilot; an extra $5 includes a commemorative t-shirt. The event is newly open to teams of five to 10, which receive discounted entry. Teams are a great way to get friends, book club members, family and neighbors involved in the fun and supporting the cause. Runners of all abilities are welcome. The race wraps with s vendor fair at the Lucky Lab Beer Hall complete with entertainment and of course Lucky Labs’s specialty (21+). Also on tap will be a silly pet tricks contest judged by local celebrities and DJ Gustav from 94/7. Register at the KEEN Garage May 16 or 17, or anytime at RunForTheLoveOfDove.com. Posted in Events and tagged with Events, Fundraiser, DoveLewis.